MiShel Designs: Jump Right In! Step on up and JUMP right in! Into the Holiday Shop Hop 2011! We've got quite a few folks signed up to participate in one capacity or another and although most of the particpants are jewelry and/or bead and supplies related, I'm still getting people leaving comments and emailing me with their information - so it's not too late for you to jump in, too! 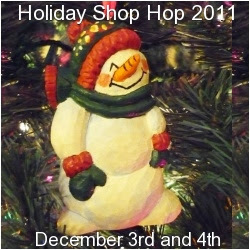 You can read all about the Holiday Shop Hop 2011 Right HERE! Saturday and Sunday, December 3rd and 4th. There are several of you who have passed this information on to your friends and fellow online artisans - THANK YOU!! This was just my small way to try and help after I read several posts and forums in respect to people wondering what they could do to try and affectively drive more traffic to their sites for the upcoming Holidays. So, head on over to the original post and after reading it and checking out the details, go ahead and sign up! And, feel free to email me with questions! Peace, Love and Here's to helping each other out this Holiday Season!! with the Holiday Shop Hop 2011 this season!